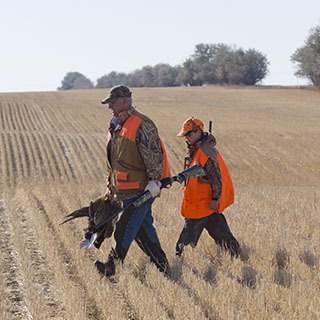 Hunting seasons may change but one thing remains the same - gun safety. Outdoor Underwriters would like you to keep the following gun safety tips in mind while you are enjoying the great outdoors. You are the key to firearms safety. Treat every gun as though it can fire at any time. Never touch the trigger on a firearm until you actually intend to shoot. Keep your fingers away from the trigger while loading or unloading. Never pull the trigger on any firearm with the safety on the "safe" position or anywhere in between "safe" and "fire." It is possible that the gun can fire at any time, or even later when you release the safety, without you ever touching the trigger again. No one can call a shot back. Once a gun fires, you have given up all control over where the shot will go or what it will strike. Don't shoot unless you know exactly what your shot is going to strike. Be sure that your bullet will not injure anyone or anything beyond your target. Firing at a movement or a noise without being absolutely certain of what you are shooting at constitutes disregard for the safety of others. Wearing eye protection when disassembling and cleaning any gun will also help prevent the possibility of springs, spring tension parts, solvents or other agents from contacting your eyes. There is a wide variety of eye and ear protectors available. No target shooter, plinker or hunter should ever be without them. Before you load your firearm, open the action and be certain that no ammunition is in the chamber or magazine. Be sure the barrel is clear of any obstruction. Even a small bit of mud, snow, excess lubricating oil or grease in the bore can cause dangerously increased pressures, causing the barrel to bulge or even burst on firing, which can cause injury to the shooter and bystanders. Don't alter or modify your gun and have them serviced regularly. Firearms are complicated mechanisms that are designed by experts to function properly in their original condition. Any alteration or change made to a firearm after manufacture can make the gun dangerous and will usually void any factory warranties. Do not jeopardize your safety or the safety of others by altering the trigger, safety or other mechanism of any firearm or allowing unqualified persons to repair or modify a gun.